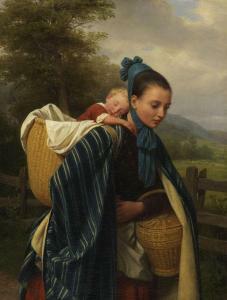 Find artworks, auction results, sale prices and pictures of Friedrich Edouard Meyerheim at auctions worldwide. 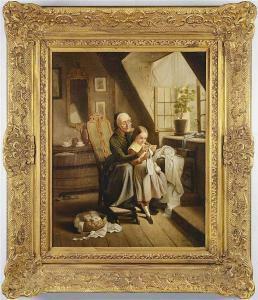 Lot 109: Friedrich Eduard Meyerheim (1808-1879) Description: GRANDMOTHER WITH HER GRANDDAUGHTER. 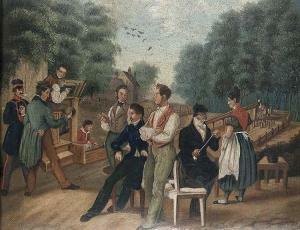 Oil on canvas, 49x39 cm, signed lower right by initials „F.E.M.“. Framed, re-stretched. Condition restored. BABIČKA S VNUČKOU. Olej na plátně, 49x39 cm, sign. vpravo dole monogramem „F.E.M.“. Rámováno, rentoilováno. Stav restaurováno. GROẞMUTTER MIT ENKELIN. Öl auf Leinwand, 49x39 cm, rechts unten monogrammiert „F.E.M.“. Gerahmt, rentoiliert. Zustand restauriert. 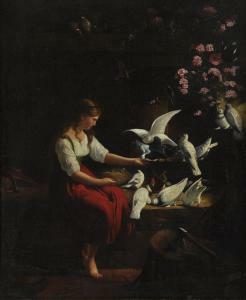 Girl feeding Doves. Oil on canvas, signed on the axe handle, thecanvas size apprx. 30" x 25", and framed in a newer gilt frameoverall apprx. 35-13/4" x 30-3/4". Condition: Relined and restored; heavy varnish masking anyinpainting. 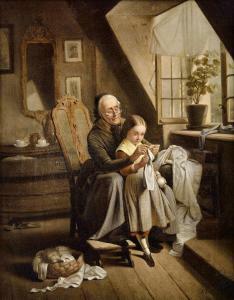 Craquelure. Varnish layer somewhat uneven.